The general view prevailing among Objectivist is that not only are paranormal occurrences unreal, but it is a waste of time to investigate such phenomenon. Yet given the millions of evidentiary claims that have been made on behalf of paranormal events, it would seem a subject ripe for investigation. If, as is eminently plausible, the Objectivists are right about the unreality of the paranormal, then an empirical investigation will merely serve to corroborate this hypothesis. If, on the other hand, there is discovered some residuum of truth in them, we will have learned more about this strange world that we find ourselves knocking about in. The advantage of Hume’s approach is that it is rigorously empirical. Hume makes no assumptions based on logical, rhetorical, or moral principles but attempts to settle the issue in relation to experience interpreted via human intelligence. Science can extend Hume’s approach by integrating it with a detailed experimental methodology. Hypotheses can then be formed and tested. Results of tests can be subjected to rigorous peer review. Hence all strange phenomenon, whether deemed as miracles or merely as the paranormal, can be made the objects of scientific investigation. Only then can we hope to have any real understanding of why so many people claim to have these experiences. The American philosopher C. S. Peirce implored us to “Never block the path of inquiry.” Yet this is precisely the consequences of those metaphysical systems which pretend they can determine matters of fact on the basis of “self-evident” axioms. But no principle concerning matters of fact can ever be self-evident. Knowledge is fundamentally transitive and indirect. It involves becoming cognizant of something outside of consciousness, that exists on a different scale from the human mind within a different realm of existence. To arrive at true knowledge of facts requires a great deal of hard work and care. Progress in knowledge requires frequent contact with the relevant facts. When this contact becomes tenuous or is lost altogether, the intellect soon becomes lost in a thicket of arid speculations. Objectivism & Physics. David Hume once remarked that, while errors in religion might be dangerous, those in philosophy are “only ridiculous.” Metaphysical errors are also, in the main, "only ridiculous." They are ridiculous rather than dangerous because they have no effect on conduct. A philosopher may have the most extravagant notions of reality, yet after he’s finished propagating his peculiar species of balderdash, he goes about his business like everyone else and, despite his absurd doctrines, has no difficulty finding his way home. “Nature is always too strong for principle,” is how Hume described the phenomenon. There are many far worse systems of metaphysics than Rand’s. Yet the very badness of these systems renders them entirely impotent. They are so bad that no one could ever make practical use of them. They are merely a kind of poetry that tender minded people lisp to themselves. Since much of Rand’s metaphysics supports notions allied to common sense, it has more potential to, by leading people astray, exercise a baleful effect. These bad effects stem from three aspects of the Objectivist metaphysics: (1) its attempt to determine matters of fact through logical and rhetorical constructions; (2) its conviction that reality is “logical” (i.e., “contradictions cannot exist in reality”); and (3) its belief that philosophy has a “veto power” over science. Philosophy certainly has a veto power over any subject if it violates principles established philosophically. So, if Heisenberg says for instance in the principle of uncertainty that causality is a myth or has been overturned on the subatomic level, you can throw out Heisenberg's theory on that grounds alone. And the same is true for the idea of something proceeding out of nothing. In other words, that is something proceeding causelessly, because there was nothing before it and it violates the very meaning of nothing…. Now, if you consult Dave Harriman's course, you will see that quantum mechanics, the theory of everything, string theory, is riddled with contradictions and is arbitrary, 'cause it reflects the corrupt epistemology dominant in the intellectual world. I want to start by stating unequivocally, there is no such thing as “space,” whether viewed as the infinite void of the Greek atomists, or the receptacle of Plato, or the absolute cosmic reference plane of Newton, or the acrobatic and curving frame of Einstein, or the final frontier of James P. Kirk. There is no such entity. Let us assume, for argument's sake, that the interpretation offered in this video is wrong. If so, then what would Peikoff or Harriman put in its place? What would constitute a "logical" interpretation of this bizarre phenomenon? Objectivists seem to believe that ordinary perception provides us with a “logical” world, and therefore that all of reality should behave as grosser objects do in perception. Since tennis balls don’t divide in two and reunite when shot through double slits, it is assumed that photons can’t do likewise. But who decided that human perception, interpreted via common sense, is the final arbiter of what’s possible in reality, particularly at the quantum level? Where’s the justification for that? Nature, not the human mind, is the standard of what is possible in nature. The reason quantum reality seems so strange is that our minds have not evolved to understand it. Our ancestors had no experience of it; knowledge of it was not necessary for their survival and reproductive capabilities; so the mind, being innocent of its oddities, is perplexed by them. But nothing is truly perplexing to a mind willing to accept nature on nature’s terms, rather than the mind's terms. Peikoff and Harriman, by allowing the Objectivist metaphysics to lead them astray, are no different than earlier metaphysicians who attempted to impose their sense of things on reality. Plato thought that the orbits of the planets had to be circular because the circle was a "divine" form. Peikoff's conviction that reality must be "logical" is no more credible. What on earth does it mean to say that contradictions cannot exist in reality? What kind of processes or events is this supposed to rule out? What would a “contradiction in reality” look like? What does it mean, in empirical terms, to say that an atom cannot be a non-atom? Or is it merely that we simply cannot conceive such “contradictions in reality”? But if we cannot conceive what a “contradiction in reality” might be, what is the point of saying such a phenomena cannot exist? If we cannot even imagine its existence, it has no relevance, either as an error or a falsehood. So again, what is this mythical gremlin, the “contradiction in reality,” and why should we bother our heads with it? Realm of Matter/World 1: the physical world, the world of matter existing in time and space. Realm of Spirit/World 2: consciousness, the world of mental objects and events. Realm of Essence/World 3: the world of ideas, meanings, theories, problems, etc. While Santayana’s realms of matter and spirit are largely identical to Popper’s worlds 1 and 2, there are important difference between the Santayana’s realm of essence and Popper’s world 3. Santayana’s realm of essence includes all possible meanings, whether anyone has experienced them or not. Popper, on the other hand, tends to confine his world 3 to those ideas or meanings produced by the human mind. These differences are not important for the points I will be trying to make about logic and reality in this post. Santayana regards logic to be “merely a parabolic excursion in the realm of essence.” If a logical construction is true, this truth derives, not from logic, but from conformity to the order of nature. In other words, when a logical proposition turns out to be true, the truth of that statement arises, not from its logic, but by the fact that it is exemplified by the real world. It is the real world, not logic, which makes a thing true. Facts, nature, reality constitute the standard of truth, not logic. I would also note that, while there exists an infinite number of logical expressions (after all, every mathematic equation is a logical expression, and there are an infinite number of such expressions), only a small fraction of those will find exemplification in existence. Logical validity is therefore no warrant of truth. If existence were actually logical, as conceived by Objectivists, then reality would have to be a system of ideal relations, like we find imagined in the idealist reveries of Plato and Hegel. In other words, this view only makes sense on idealist assumptions. But on realist assumptions, reality may be anything it pleases. It is not for the mind to determine how reality must be. On the contrary, the mind must accept whatever it finds. And since we have not experienced every possible fact of nature, all theories about facts are ultimately conjectural, and must be revised or overthrown if a fact is discovered that contradicts them. Facts, therefore, for all practical intents, are contingent — which effectively means, alogical and "unnecessary." If a fact contradicts one of our theories about reality, it is the theory that has to go, not the fact. I suspect there will be Rand apologists who will protest that Objectivism denies no facts. Well, that’s not so clear, as we shall see in my next post. Notice that neither [the axiom of existence or the axiom of identity make] any specific statement about the nature of what exists. For example, the axiom of existence does not assert the existence of a physical or material world as opposed to a mental one. The axiom of identity does not assert that all objects are composed of form and matter, as Aristotle said. These things may be true, but they are not axiomatic; the axioms assert the simple and inescapable fact that whatever there is, it is and it is something. In other words, she draws from these axioms: (1) that the universe is permanent and can neither be destroyed nor created; (2) the universe is not ruled by will or chance, but by the “law of identity”; (3) everything that happens is caused by the “identities” of the elements involved. She also implies that the basic constituents of the universe, whatever they may happen to be, are non-mental (i.e., atoms, particles, or forms of energy). How does Rand draw all these things from these axioms when, according to Kelley (who, in this instance, is being entirely orthodox) these axioms only assert that "something" distinguishable exists? Here we stumble upon another one of those equivocations that are so plentiful within the philosophical swamps of Objectivism. On the one hand, we’re told by Kelley that “The axioms and their corollaries are not rich in specific content that would allow specific inferences.” And yet Rand give us specific inferences: the universe is permanent, it’s not ruled by chance, causes stem from identities, etc. The law of causality is the law of identity applied to action [wrote Rand]. All actions are caused by entities. The nature of an action is caused and determined by the nature of the entities that act; a thing cannot act in contradiction to its nature. Causality is the principle that entities act in accordance with their natures. Because actions are aspects of the entities that act, the actions are part of the identity of the entity. But the law of causality also says an action is not a primary, independent aspect of a thing’s nature, unrelated to other aspects. The law says that any action depends on underlying attributes of the thing, such as its mass, material composition, and internal structure. The basic confusion at the root of the Objectivist view of causality is a conflation of logical identity with identification. Logical identity, as I explained in my last post, is merely the identity of a term of thought with itself. Identification, on the other hand, involves, among other things, determining which term of thought will stand as a symbol for an object, property, event or process taking place in the “real” world (i.e., the world outside of consciousness). Identification of specific entities does involve (as is suggested by Objectivism) noticing the attributes of those entities, but the ascription of an attribute to an object does not involve logical identity, it involves predication. White is not identical to swan; it is predicated of swans. As I noted in my previous post, predication does not assert that A is A, but that A is B (that is to say, A has attribute B). The phrases Swans are swans and Swans are white are not logically compatible. They use the term are (the plural of is) in different senses. To imply an equality (or, worse, an identity) is to lapse into equivocation. "A is A" is ... a tautology, but an important one: every time a person is guilty of a logical inconsistency he is saying A and then in the next breath not-A. Thus "A is A" is something of which we need to remind ourselves constantly. But it is not … an empirical statement: we don't have to go around examining cats to discover whether they are cats. (We might have to examine this creature to discover whether it is a cat.) But ... statements of what causes what, such as "Friction causes heat," are empirical statements; we can only know by perceiving the world whether they are true. How ... can the Law of Causality be merely an application of the Law of Identity? You could manipulate the Law of Identity forever and never squeeze out anything as specific as a single causal statement. Causality is neither a product of logic or necessity. In fact, it is not a product of any idea. Rand’s approach to metaphysics would only be valid if the world followed ideas by necessity, as it did according to Plato. But if ideas merely describe the world, then no matter of fact can be regarded as logically necessary. Logical necessity only makes sense if the world follows logic—and most of the evidence at our disposal suggests that logic most emphatically does not hold any sort of empire over fact, but that, rather, logic is a tool useful for testing claims of knowledge. Consideration of this issue leads to another of Rand’s errors, namely, her conviction that reality is “logical.” I will address this delusion in my next post. Neil Parille gives us the lowdown on the latest bustup in Randland. The latest Objectischism is underway. Schisms, excommunications, denunciations and sometimes even recantations are prominent features of Objectivist life and form an entertaining Kremlinology to those of us interested in the Objectivist microverse. While not as cosmic an event as the David Kelley excommunication in the 1980s - thus far only John McCaskey has been excommunicated from the movement - this one seems to be a sign of growing Objectivist frustration with Leonard Peikoff and the tone of orthodox Objectivism. John McCaskey is a well credentialled Objectivist scholar. He holds a doctorate from Stanford University in the history of science, where he currently teaches. He was, until recently, on the board of directors of the Ayn Rand Institute. He has written for the Objective Standard, the house organ of the ARI. He has spoken at Objectivist Conferences. McCaskey appears to be tight with orthodox Objectivist figureheads such as Allan Gotthelf and Harry Binswanger, but has “rarely spoken” to Peikoff. Orthodox Objectivism has well credentialed physicists such as Keith Lockith (Ph.D. from the University of Wisconsin) and Travis Norsen (Ph.D. from the University of Washington). Both have lectured at Objectivist Conferences and have lectures sold by the ARI’s bookstore. Although Rand didn’t write anything on the philosophy of science, oral tradition has it that she was skeptical of what little she knew of modern physics. Peikoff doesn’t appear to know much about physics and what little he knows is from Harriman. (In Peikoff’s 2006 DIM lectures Peikoff said he had never heard of Richard Feynman, probably one of the few household names in physics in recent years.) It’s been rumored that there is discontent with the preeminent position Harriman and Peikoff have when it comes to physics. Something must have been “going down” because on August 11 and August 23 Gotthelf and Binswanger - a pair practically Pynchonesquese in their reclusiveness - posted brief five-star reviews on Amazon praising Harriman’s book. Prior to these reviews Gotthelf and Binswanger had a combined eleven reviews on Amazon going back to 2000. 3. Peikoff’s behavior has become increasingly erratic. In 2006 he issued a fatwa against anyone who was considering not voting Democratic, going so far as to claim that they didn’t understand Objectivism. He recently made a similar statement concerning Objectivists who believe that Moslems have a legal right to build a Mosque near the site of the September 11 attacks in New York City. He has called for a nuclear attack on Iran. When he speaks at an Objectivist Conference a disclaimer is published that his attendance doesn’t mean he agrees with everything other people say. 4. 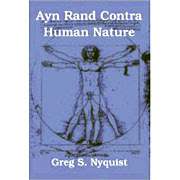 Peikoff, for whatever contributions he has made to Objectivism, has actually hurt Rand’s reputation. For example, in 2005 he sponsored James Valliant’s cracked The Passion of Ayn Rand’s Critics, a book which, far from rescuing Rand, made her look worse. He has permitted people like Harriman to rewrite the published version of Rand’s posthumous material in classic cult of personality fashion. Peikoff said in 1987 that Barbara Branden’s biography of Rand was “arbitrary” and would eventually be countered by an authorized biography. No such biography has appeared, but two independent biographies were published in 2009 both generally supportive of Branden’s. It must be increasingly obvious to younger Objectivists that the Peikoff line that Rand’s only character flaw was occasionally blowing her top was dishonest. In 1968, Rand kicked out Nathaniel Branden (a psychologist). In 1976 she so harangued Alan Blumenthal (a psychiatrist) that he quit. Shortly before her death she booted out Robert Hessen (a historian). Leonard Peikoff has excommunicated not only David Kelly but George Reisman (an economist) and his wife Edith Packer (a psychologist). The McCaskey Objectischism continues a trend of Rand and Peikoff breaking with independent thinkers who for ideological or personal reasons don’t toe the party line. Identity is the most equivocal of Rand's axioms. The equivocation centers around the word is. The phrase A is A and A thing is itself do not necessarily use the term is in the same sense. A is A merely illustrates the identity of a term of thought with itself. It is unproblematical and obvious because it is tautological. If by a "thing" we mean an object in reality, the identity of thing to itself is not entirely unproblematic. In noting that a A is A, you are merely noting an obvious identity of an essence or a sense-datum with itself. In noting that a thing is itself, you are going beyond the simple identity of terms of thought to making assertion about both existence and the qualities of the existing thing. The phrase A is A is not equivalent to the phrase a thing is itself. They do not describe the same type of identity. A term of thought is always and eternally identical to itself. Not so with a thing, which exists in the flux of nature and is subject to changes in its material constitution, even to the point of destruction. When one asserts a thing is itself, one is not asserting pure identity; on the contrary, one is both asserting the existence of the thing and predicating its attributes. These are very different matters from asserting the identity of a term of thought with itself. Very quickly let's examine these five of these seven meanings. Identity is merely the identity of a term of thought with itself, as mentioned above. Equivalence is the identity of words of similar meanings, such as synonyms and words from other languages (i.e., nothing = rien = nichts = nada = niente). Definition is similar to equivalence, except that a phrase is used instead of another word. Predication is not A is A but A is B (as in snow is white), and involves a contradiction if it is confused with identity (i.e., blood is blood and red is red, but although red can be predicated of blood, red is not identical to blood nor is blood identical to red). Existence indicates that a term of thought describes an object or event or process existing in the flux of nature (i.e., instead of A is A, existence merely contends that A is). Actuality and derivation are a bit too complicated to be discussed here, so I will ignore them. Whatever you choose to consider, be it an object, an attribute or an action, the law of identity remains the same. A leaf cannot be a stone at the same time, it cannot be all red and all green at the same time, it cannot freeze and burn at the same time. A is A. While it is true that a leaf cannot be a stone "at the same time," this truth is neither self-evident nor a consequence of A is A. The fact that a term of thought is equal to itself has nothing to do with whether a stone can be a leaf "at the same time." The judgment about stones and leaves involves several important presuppositions that, while true, are not logically irrefutable or "self-evident." To understand that a stone cannot be a leaf at the same time one needs to assume the existence of time and change, both of which rely on the trustworthiness of memory (which, of course, is not entirely unproblematic or "axiomatic"). Once time and change are understood, it is easy to infer that a stone cannot be a leaf at the same time, because the phrase at the same time precludes change of any sort, and freezes every object into an instant of eternity. Yet because the world of nature exists in time, this observation is rather trivial and not terribly useful. In the flux of nature, the material substance in a stone may become the material substance used in the constitution of a leaf, so that a stone may in fact become a leaf if enough time is allowed to effect the process. The process of change tends to be far more relevant to understanding the real world than do assertions about the identity of an object to itself at "any given instant in time." The identity of a term of thought is simple and unproblematical. Not so the "identity" of an object like a leaf or a stone existing in the flux. When we "identify" a leaf or a stone as a leaf or a stone, we do so by noting the attributes of the leaf and stone, which are predicated of the object, and by presuming the object's existence. In other words, such "identification" involves predication and existence, rather than Rand's simple A is A identification. Even more objectionable, in this context, is a statement by Leonard Peikoff. "A characteristic is an aspect of an existent," he writes. "It is not a disembodied, Platonic universal. Just as a concept cannot mean existents apart from their identity, so it cannot mean identities apart from that which exists. Existence is Identity." If by characteristic Peikoff means something like color or texture, his verbiage here is complete nonsense. A color or a texture is not an aspect of an existent: it is a mental datum that symbolizes a property of the existent. Mental data are "disembodied" (i.e., non-material), Platonic universals! (Of course, such universals don't have the metaphysical powers Plato ascribed to them, but that's a separate issue.) Since such datum can be used as descriptions of properties of other existents, they are indeed "apart" from that which exists. Yellow can be used by the mind to describe both the sun and a buttercup. It can even be contemplated as an object of the "mind's eye," as when we imagine a yellow patch. This yellow, while perfectly identical to itself, is not identical to the property it symbolizes in reality (which is the manner in which an object reflects light). Since knowledge is fundamentally representational, identity is largely irrelevant. Knowledge is not a mirror. A concept or a name is not identical to the object or property which it points to and represents. The concept of a cat is not identical to the existing cat, nor is the name Barack Obama identical to the 44th President. What we seek for in knowledge is not identity, but appropriate representation. Knowledge does not reduplicate existents, it describes them. This description assumes (1) the existence of the object and (2) the reality of the properties that are predicated of the object. Existence, therefore, is not Identity. When I acknowledge that an individual of my acquaintence is John Smith, I'm not claiming that either the name John Smith or my idea or concept of John Smith is identical to the real John Smith. I'm merely noting a naming convention that allows me to be understood when I state my opinion about John Smith to other people. That opinion, even if true down to the minutest detail, will nevertheless not be identical with the real John Smith in the A is A sense of identity. It will be a veracious description, nothing more. Therefore, when Rand berates her ideological opponents for evading "the fact that A is A," she means something different from what is encaspulated in her axiom of identity. Her opponents, even when wrong, are not guilty of evading A is A. Who denies that a term of thought is equal to itself? If her opponents have evaded any facts of reality, they are guilty of two possible errors: (1) of denying the existence of something that really exists; or (2) denying that some existent has a specific property. In other words, they are guilty of evading, not identity, but either existence or predication (i.e., they are guilty of evading A is or A is B). Rand’s axioms: Consciousness and the discovery of other minds. When Rand declared "one exists possessing consciousness, consciousness being the faculty of perceiving that which exists," she believed she was stating an axiomatic truth "fundamentally given and directly perceived." But note the use of the pronoun one, which is intentionally vague. Note that she doesn't say "I exist possessing consciousness." By saying "one exists possessing consciousness," she is making the tacit assumption that everyone exists possessing conscious. But how does she know (in the axiomatic sense of the term) that other people are conscious? Even if (assuming, per impossible, that one's own consciousness is perceived directly) surely we don't perceive the consciousness of other people directly. If so, how can the consciousness of other people, of which we have no direct experience, be regarded as axiomatic? Even if I were to wave my previous objections to Rand's "axiomatic knowledge" and her foundationalist pretensions, I still don't see how Rand can justify the belief that other people's consciousness is axiomatic. Even if it were so for each individual, this knowledge would remain exclusively personal. Each individual might regard his own consciousness as "axiomatic," but he could only accept the consciousness of others on purely non-foundationalist grounds. Such knowledge remains conjectural, even on Objectivist premises. This issue reinforces the view that objective knowledge (i.e., knowledge that is true absolutely, whether anyone recognizes it or not) is conjectural right from the start. Anything that is "fundamentally given and directly perceived" is only given and perceived by an individual. How does that individual know that such knowledge is "fundamentally given and directly perceived" by others? While the reports of other people may constitute evidence for a given claim of knowledge, it is not clear how the validity of an axiom can depend merely on such reports. The testimony of others is like memory: although often reliable, it can hardly be regarded as infallible or as the foundation of "self-evidence." While there exists compelling reasons to believe that at least some knowledge deserves to be regarded as "objective" and reliable, these reasons don't measure up to the standards required of Rand's axioms. The discovery of other minds, far from being axiomatic, probably results, as does most of our knowledge, from trial and error, experimentation and pragmatic tests. Contrary to Rand's ex cathedra assertions, the mind is not a blank slate. Interpretative predispositions exist right from the start. It seems likely that one of these predispositions is a tendency to regard events in the world as the outcome of some purpose or intention. The default position for the human mind may very well turn out to be some form of animism, so that our first tendency is to look for intention, will, mind, and consciousness in the objects around us. Only later, after much groping and error, do we begin distinguishing between the animate and the inanimate, the conscious and the unconsciousness. These discoveries are explorative and empirical right from the beginning. Knowledge does not arise (as Rand's axioms appear to) by analyzing "given" existents. A particular "given" existent is merely a piece of datum, blank and staring. Nothing of any significance can be deduced or proved or "validated" from such a datum. Knowledge arises when, instead of staring at our datum, we regard such representations as symbols of an outlying reality the constituents of which can be investigated, tested, analyzed and discovered. As Santayana puts it, "only by exploring the flux of nature, by experience or testimony, ... [can] I judge whether my original description, granting my terms and circumstances, was a fair description of what actually lies there." Even though many of Rand's metaphysical assertions are true, her reasons for them (i.e., her explanation of how they are known and justified) are false. No statement about matters of fact, regardless how obvious or irrefragible it may seem to the intellect, is ever "justified" by either "direct" observation (since observation of fact is never direct) or through the analysis, logical or otherwise, of mental data (and all data are mental). Factual knowledge (which means significant, relevant knowledge) is not only conjectural, but empirical as well; indeed, it is conjectural because it is empirical. It is not through logical analysis, but through empirical practice and experimentation, that we learn which conjectures are reliable and can be used as guides to action and which are suspect and will only lead us astray. Rand’s axioms: one exists possessing consciousness. While no sensible person would deny that physiologically normal individuals "possess" consciousness, it is questionable whether such a fact deserves to be embalmed as an Objectivist axiom. Remember that these axioms are, according to Rand, "fundamentally given and directly perceived." Now it must be admitted that consciousness, however obvious its existence may seem to the intelligent observer, is neither given nor directly perceived. All that is "given" is the solipsism of the present moment, out of which no knowledge (including axiomatic knowledge) can ever arise. Knowledge, whether axiomatic or otherwise, requires (among other assumptions) trust in memory and belief that what is given (i.e., some datum or "essence") can serve as a description or symbol of real things or events taking place in a substantive world existing in space and time. Consciousness, far from being given or directly perceived, is only recognized through an act of inference. Since (as even Rand admits) consciousness cannot be conscious merely of itself, direct perception of consciousness is an incoherent notion. There are some philosophers, who imagine we are every moment intimately conscious of what we call our SELF; that we feel its existence and its continuance in existence; and are certain, beyond the evidence of a demonstration, both of its perfect identity and simplicity. The strongest sensation, the most violent passion, say they, instead of distracting us from this view, only fix it the more intensely, and make us consider their influence on self either by their pain or pleasure. To attempt a farther proof of this were to weaken its evidence; since no proof can be deriv'd from any fact, of which we are so intimately conscious; nor is there any thing, of which we can be certain, if we doubt of this. impression must continue invariably the same, thro' the whole course of our lives; since self is suppos'd to exist after that manner. But there is no impression constant and invariable. Pain and pleasure, grief and joy, passions and sensations succeed each other, and never all exist at the same time. It cannot, therefore, be from any of these impressions, or from any other, that the idea of self is deriv'd; and consequently there is no such idea. What Hume says of the self (or "personal identity") is easily transferable to consciousness: these are not realities that can be directly perceived or fundamentally given. They are, rather, inferred from the very process of perceiving. The inference by which intelligence identifies consciousness is so obvious and inescapable that it may seem as if it were given through direct perception. But it clearly isn't. Another problem with the Objectivist axiom of consciousness is the vagueness of the term itself, especially within Objectivist writings. Rand tended to use it in several different senses, and it is not always clear, in each of her usages of the term, which sense she means. It would seem that, in this axiom, Rand is using consciousness in the sense of raw sentience. Consciousness, in this sense, is merely the light of awareness. Generally speaking, however, she seems to identify consciousness with intellect or mind. At other times, she identifies it with the self or the will, describing it as "the faculty of awareness" and as "an active process." She even goes so far as identify consciousness with knowledge: if "no knowledge of any kind is possible to man," she opined, then "man is not conscious." As we shall note in later posts, Rand's tendency to play fast and loose with the term consciousness enables her to equivocate her way to precisely the sort of metaphysical conclusions she desires to reach. While the notion of consciousness may seem "inescapable" (at least via inference) to a foundationalist mindset, only consciousness as raw, passive sentience would be "inescapable" in this sense. After all, surely even Rand would not declare that intellect or knowledge are "axiomatic"! This being so, it is not clear how inferences against idealism or traditional monotheism can be justified using this axiom. But more of this anon.